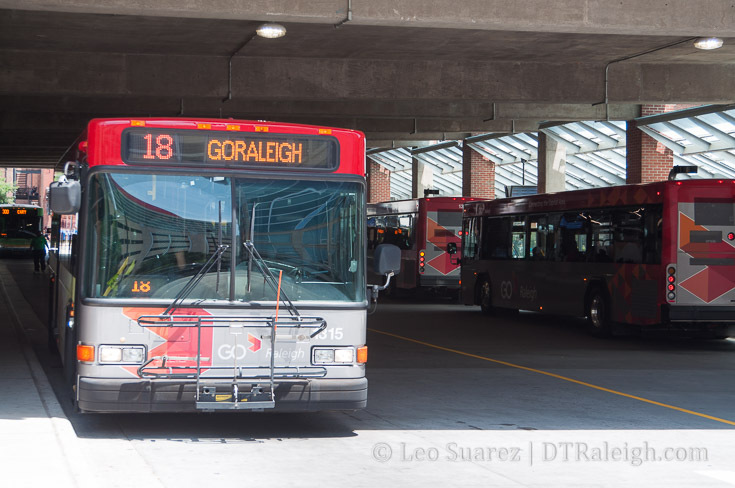 After a year of construction work, the bus station at Moore Square, renamed to GoRaleigh Station, is now fully up and running with a new look and new amenities. Having had the same basic layout and services since the 1980s, the station upgrade is very much welcomed. With the ribbon cut a few weeks ago, it was time I walked it and snapped some photos for the blog. 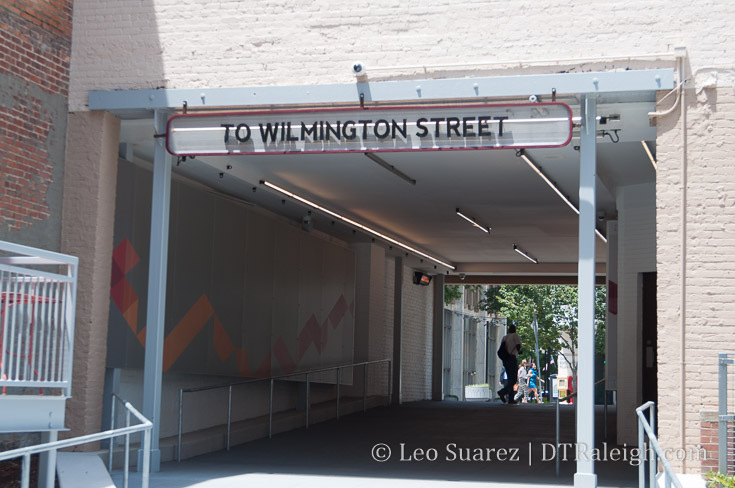 The station can be entered from all different directions but for me, I consider the entrance on Wilmington Street to the be the front door. Here, you can typically hear classical music and on this particular walk, I was greeted with the sounds of tango with Por una Cabeza. 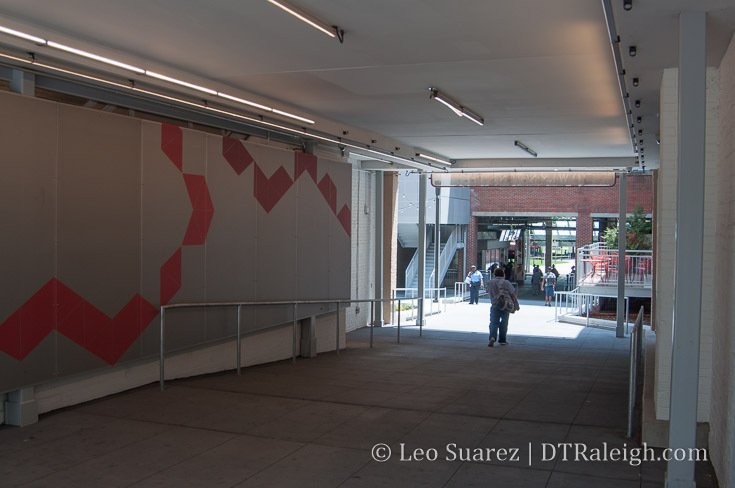 The walkway leading into the heart of the station has changed a bit with an outdoor plaza, covered in string lights, at the base of a brand new elevator shaft and airy stairwell. 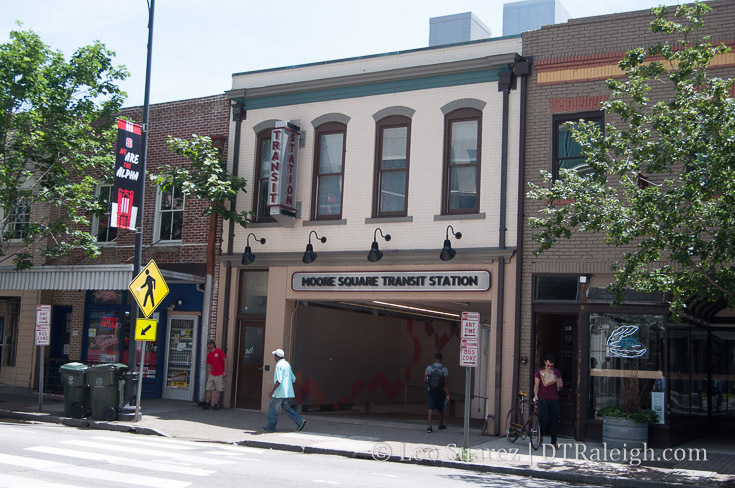 This replaces the former stairwell and elevator that was situated on the eastern portion of the Moore Square parking deck, having been removed during this project. 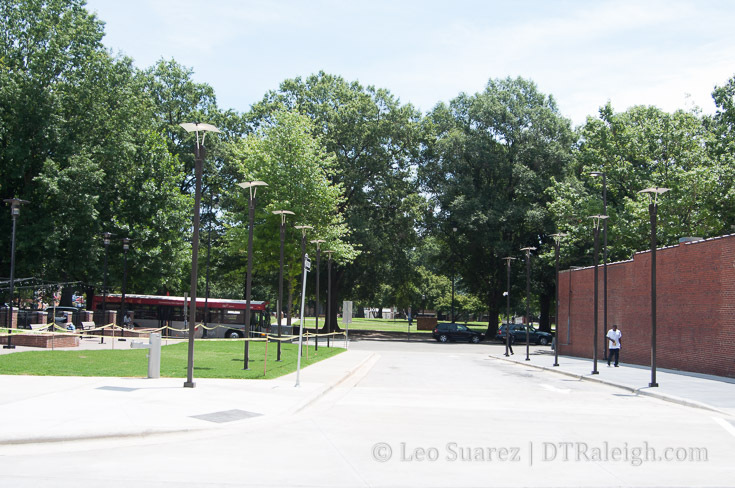 Below is a surround shot of the plaza and walkways into and out of the station. The outdoor seating of the nearby restaurant St. Roch Fine Oysters + Bar is here as well. 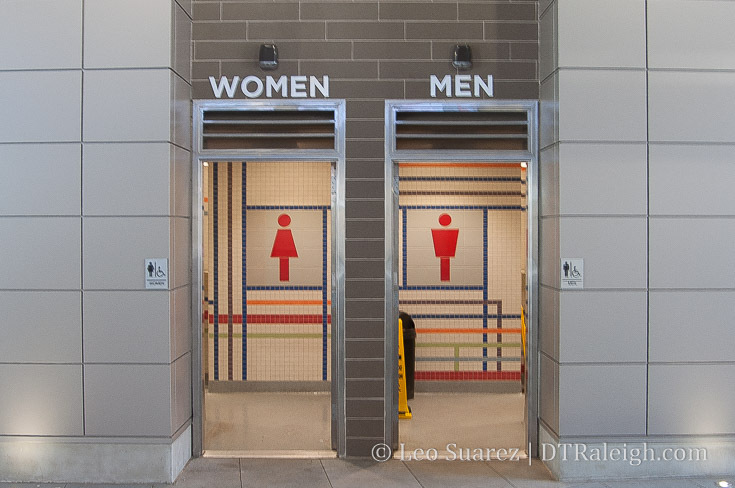 Going into the station, we can see the brand new amenities in an updated office/kiosk as well as bathrooms. 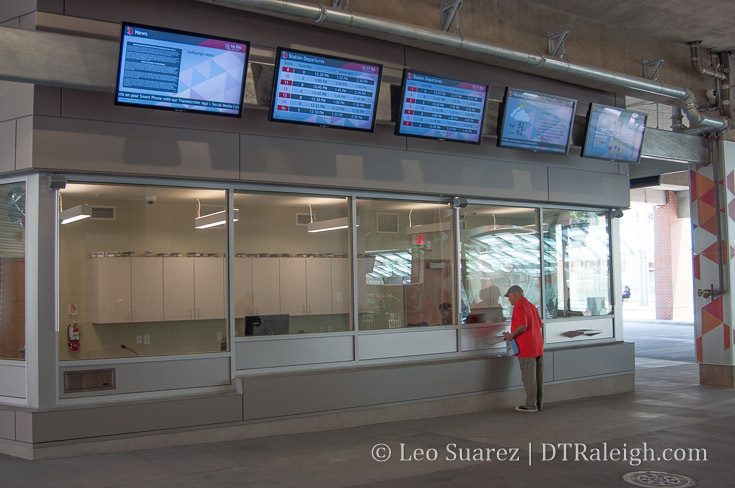 TV screens are plentiful and informative all throughout with route information and estimated time of arrivals. 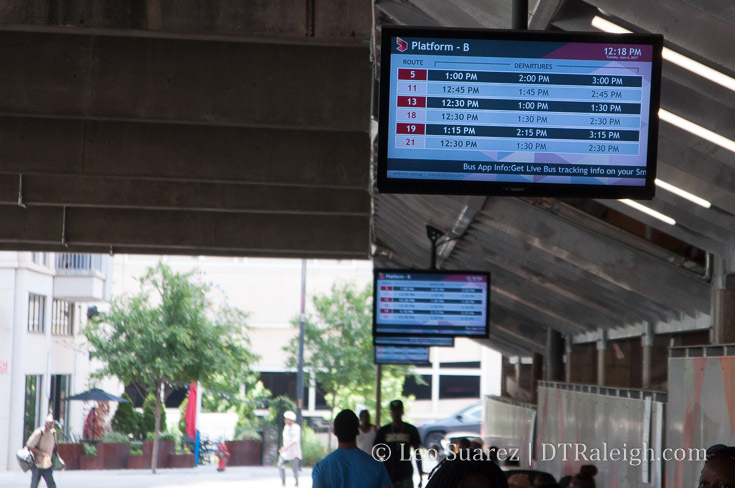 To the left and right are the various wait stations for all the routes. The ones underneath the parking deck are obviously covered but the ones outside have brand new shelters that help block wind, rain, and provide shade. There are no longer any shelters along the road exiting on Blount Street and buses are coming and going from Hargett and Martin. 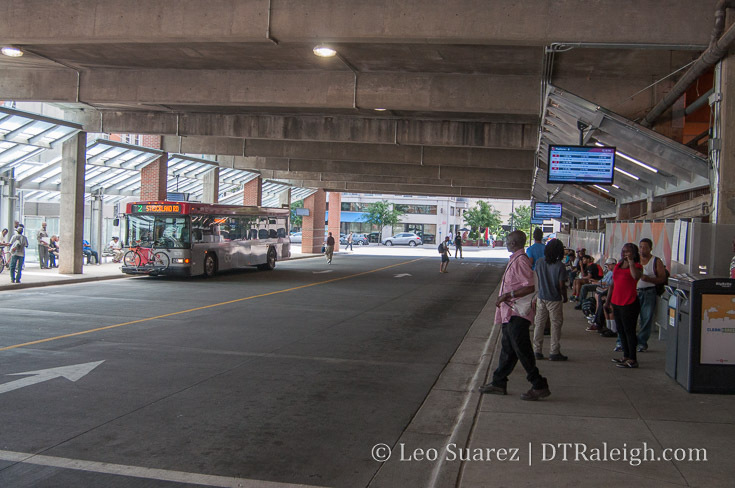 This is a change from before where buses would only enter on Martin and exit on Hargett so I imagine that helps with route planning. 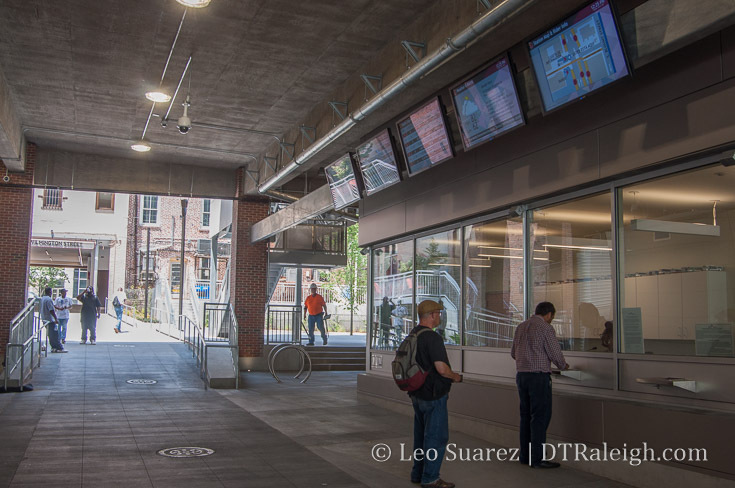 A big difference has been the feel and presence the station used to have along Hargett Street. The brick entrance gateway thing has been removed and with the new shelters and roadway, the entrance feels much more open. With the new design, you can see the buses approaching and they can see you. This makes “negotiating” your way across the sidewalk on Hargett easier as before, it was always possible that a bus might jump in front of you at the last second. Heading back inside, I passed back in front of the kiosk towards Wilmington Street. 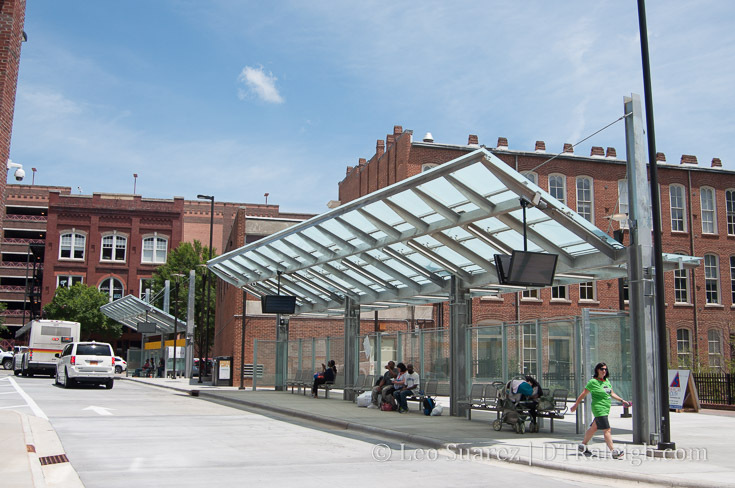 Wilmington and Fayetteville Streets feel so accessible with the station providing a direct shot back and forth. Congrats to the team behind this project. I enjoy walking through the station, even if I’m not a bus rider, and hope that the people it serves are enjoying it as well. 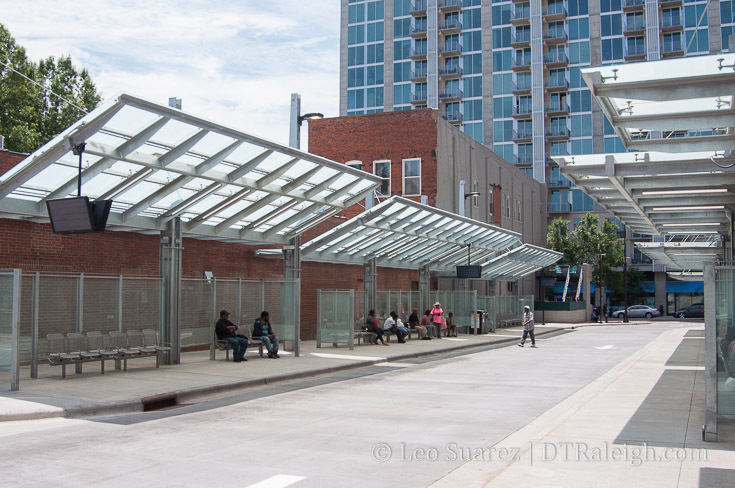 As transit in Raleigh expands over the next ten years, the station seems to be set up to handle that growth. A mural on the brick wall of the parking deck (as seen in the 4th pic from the bottom) would look really awesome. Who with the city can we contact about allowing that? A living wall would look nice too. Those are both good options. 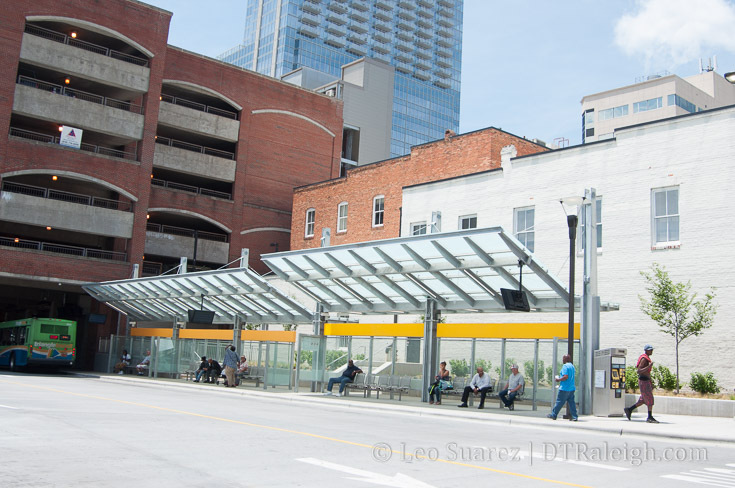 Also, worth noting that the yellow light boxes will be installed on all of the canopies by mid July. nice job designers! and executioners! The station is WAY better. But be warned the website is not updated to match. At least not where you catch the CRX….I waited 45 minutes where the .pdf told me to wait (it was the old location on Wilmington St) and the ticket window was closed so I couldn’t ask them and eventually walked around looking at screens until I figured it out. I didn’t notice a master route screen….if there is/was one that would make it muc easier. Raleigh artist Molly Chopin would be a wonderful person to contact about creating a mural for this space. She’s been making an impact throughout the local art scene and I know she really enjoys rare opportunities to work at this sort of scale.